I could eat pizza everyday. Except that I try to limit white flour products and most “whole wheat” pizza crusts at the store aren’t really whole wheat. Not to mention in an “ideal world” I would only eat sprouted wheat but unfortunately that is not my real world. 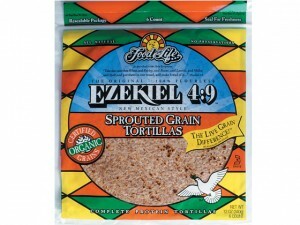 Enter the Ezekiel tortilla. 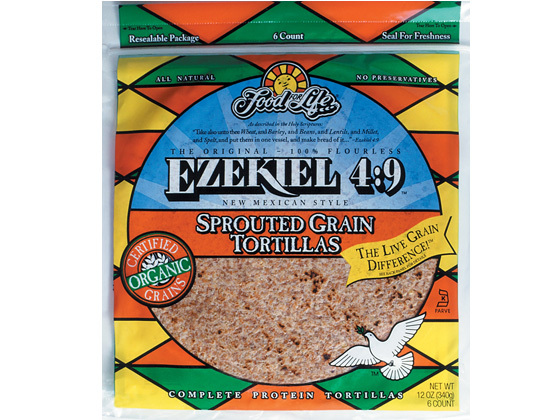 Ezekiel bread has been my bread of choice for the past 6 years but my love affair with Ezekiel tortillas is still in its honeymoon phase. I’m excited about our future together. Brent sprinkled lemon juice and garlic salt on the chicken while it was cooking. When it was almost done he basted it with a bit of BBQ sauce. 2. 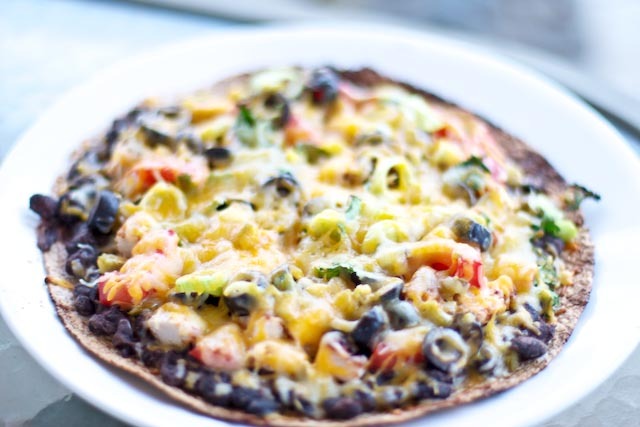 Layer your tortilla with the rest of the ingredients. 3. 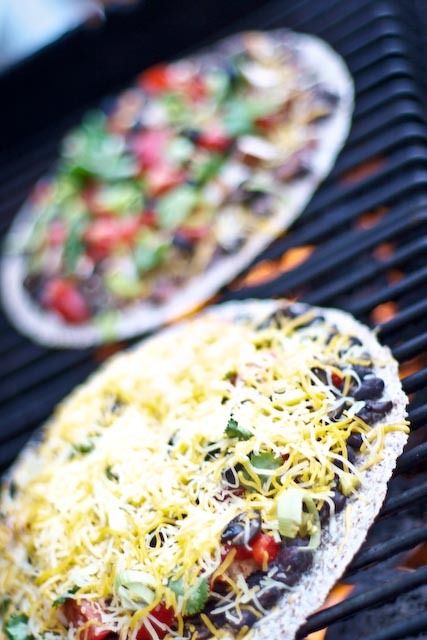 Put your pizza back on the grill until the bottom is crispy and the cheese is melty. 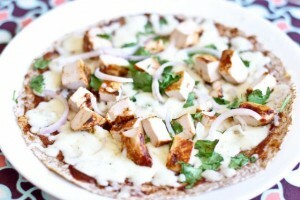 I also make these in the toaster oven or oven. My trick is to lightly toast the tortilla before piling on toppings. Then stick it in the oven again for a second go around. But this day we used the grill. Yum. 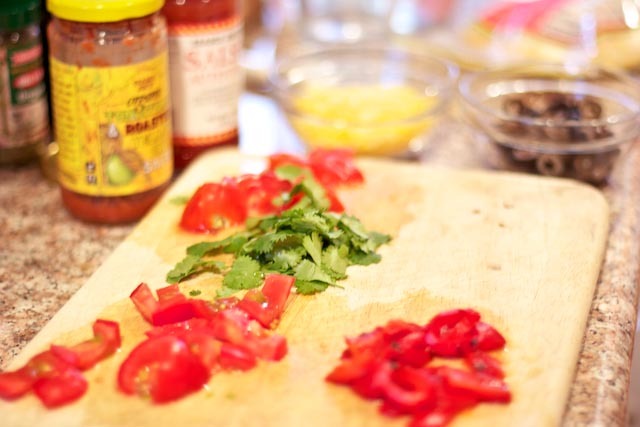 Nutritional info according to the above recipe. I should note that this pizza has a nice 12 g of fiber. Mine with the cheese hidden under the veggies. Not only to do love pizza but I love other bloggers. 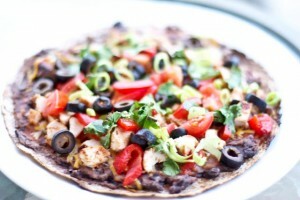 I’m honored to be featured over on Lisa’s awesome blog Workout Mommy. I’d be thrilled if you go check out my One Fit Mommy interview! Looks so delicious!! I’ve never had a grilled pizza, must try it!! 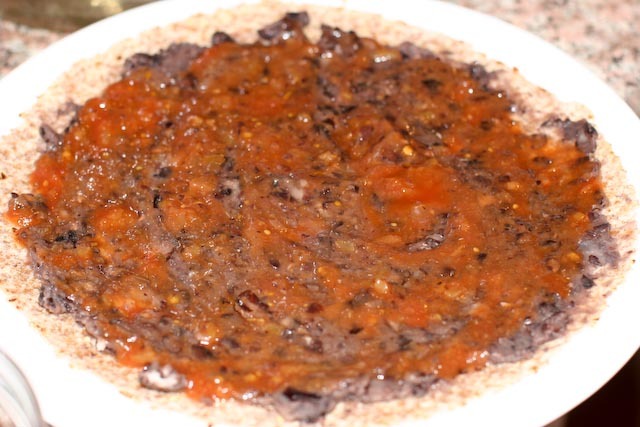 I love Ezekiel tortillas, but I have never used them to make pizza. I’m putting them on my “must make” list! Loved your interview on Workout Mommy! You are so right, we can’t afford not to take care of ourselves! I’ve never tried a grilled pizza before! It sounds amazing though, definitely worth a shot! Those pictures made my tummy rumble. I’m definitely gonna try these. Mmmm! 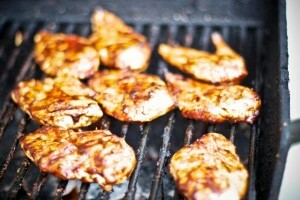 We just got the grill cleaned so we will have to try this! I made something similar off of weight watchers a while ago. That looks really good! Thanks for letting me know Courtney!! I’m glad you liked them.